Hair is the crowning glory of men and women alike. Since centuries, we have know what importance does a lustrous mane holds. Even today, it’s the key to our self confidence. Healthy hair is considered to be the most positive sign of a person’s health. Like everything else in our body change as we age, so do our hair. The change in color or greying as it’s commonly referred to be a sign of ageing. But, sometimes age may not be the reason behind greying. It can be due to various other reasons like genetic, nutritional deficiencies etc. But there are some home remedies which can rescue you from this situation. Indian Gooseberry, as it’s often called is the one everyone relies on. It always brings out the best results when it’s the case of white hair.Its juice can be used to massage the scalp when mixed with almond oil or dried Amla can be boiled with coconut oil and this herbal oil can be applied to the roots of the hair for best results. This will result in turning the greys into black once again. You may not like the idea of onions or the way they smell but it’s been scientifically proven that they have the right agents to reverse greying of hair. Sometimes, the scalp and the hair follicles show a build of hydrogen peroxide which doesn’t allows the hair follicles to receive any nutrition resulting in hair thinning and greying. The chemical found in onions neutralizes this build up and thus helps in the treatment of greys naturally. They are excellent mediums to treat grey hair. Whether included in diet or when applied locally as hair tonic which can be made by boiling them with coconut oil, they serve the purpose of reversing greying of hair. 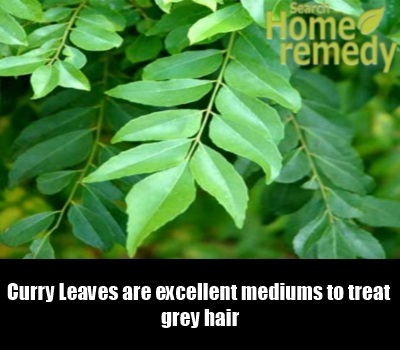 Curry leaves have the properties which provide strength to the hair and naturally boost hair growth.Thus the hair which grows is naturally pigmented and healthy. The hair tonic made out of curry leaves controls the pigmentation of the hair. Butter made out of cow’s milk has been hailed since centuries as a cure for several diseases. It’s full of nutrients which allow the body to heal, prevent and fight against many problems. Greying of hair is one of them. To ward off the premature greying, butter can be taken normally in the diet on a daily basis and also it can be applied to the roots of the hair twice/thrice a week for desired results. Massaging oil ensures proper circulation of blood and supply of nutrients to the roots of the hair which in turn makes the shaft healthy and strong.Almond oil plays a great role in the treatment of grey hair. Also, you can massage your hair daily with the concoction of coconut oil and lemon. It’s considered one of the easiest and cheapest ways to make sure your greys are a thing of the past. Black tea gives the right pigment to the hair when used regularly and thus controls the greying of hair. All you have to do here is prepare a cup or two of black tea depending on your requirement and add a table spoon of salt for each cup prepared in it. After it cools down and reaches a lukewarm temperature, you need to massage it into your hair and keep it on for half an hour before rinsing it off. It’s always a better option to use Henna than the other harmful colouring options available in the market. Henna not only colours your hair but ensures that your hair is healthy and strong. There are various ways of applying Henna to your hair.Here is one of the easiest ones; you need to mix some Castor oil and lemon juice till it becomes frothy. Now add Henna and apply this mixture, leave it on for an hour at least before shampooing as usual. You need to repeat this ritual on a daily basis for desired results. This oil is one of the most widely used oils in India. Due to its miraculous properties of making hair strong, healthy and lustrous, it’s widely to prevent all sorts of problems of the hair. Its regular use ensures that your greys are taken care of completely. If you are thinking about how to make it, don’t worry as its easily available on any of the medical stores in most places. The best part about using rosemary in the treatment of grey hair is that it’s easily available and is used widely to naturally darken the hair colour.It can be used by boiling it with coconut oil and applied to the hair or can be used to make a herbal tea which can taken internally for best results. Black walnuts can be used to colour hair naturally. Their use is relatively easier than others.You have to boil the outer hulls of some black walnuts to make some tea and use it as a natural hair colourant. The best part about this colour is that it can last up to 6 weeks even after regular washing of hair. To make sure that your hair doesn’t become the victim of premature greying, you must include foods that are essentially rich in proteins as our hair is made of a protein called Keratin, iron, Vitamins A, B and C. Also, most of the times hair whitening is caused by copper deficiency. You can try and take some copper supplements. Try and reduce the intake of coffee, tea, alcohol and quit smoking except the reduction of oily and fried foods. Stress and smoking also are major culprits in making hair prone to whitening. Other Home Treatment Options: Use of neem seeds, sesame seeds, carrot juice, Amaranth, Ribbed Gourd, Aloe Vera, ashwagandha, bhringraj oil can be used to reverse the greying of hair when used on a regular basis.A lustrous mane is what gets you your due attention everywhere. It takes your confidence at higher levels. It’s something you cannot do without. To ensure your hair get the best of the best, don’t forget to use the above mentioned methods to overcome the problem of graying hair.